We have just published an updated version of the cross-compilation toolchains available at toolchains.bootlin.com. 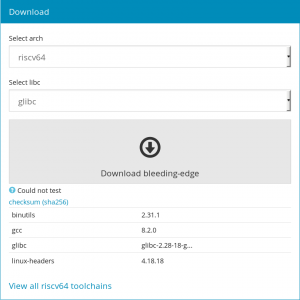 A RISC-V 64 bit toolchain is now provided, following the addition of support for this architecture to the Buildroot project. The stable toolchains are now using gcc 7.3.0 (instead of 6.4.0), gdb 7.12.1 (instead of 7.11.1), kernel headers 4.1.52 (instead of 4.1.49), glibc 2.27 (instead of 2.26), musl 1.1.19 (instead of 1.1.18) and uclibc 1.0.30 (instead of 1.0.28). We are still using a 7.x gdb version because the 8.x versions need C++11 support, which requires a recent enough host compiler, which in turn requires using a more modern distribution. Thus, those toolchains would be unusable with older distributions as they would require a recent glibc version on the host. Currently, our stable toolchains are still built within an old Debian Squeeze system, for maximum compatibility with old distributions. The bleeding-edge toolchains are still using gcc 8.2.0, but gdb is now 8.1.1 (instead of 8.1), kernel headers 4.14.80 (instead of 4.14.57), glibc 2.28 (instead of 2.27), musl 1.1.20 (instead of 1.1.19). We will continue to update those toolchains with more recent versions of gcc, binutils, gdb and the different C libraries, and add support for more architectures. Do not hesitate to ask for additional features or report any issue encountered when using those toolchains in our bug tracker. Don’t have any RISC-V’s yet but this is yet another reason to get one! Keep up the good work!